SwimRun has come a long way since it was born from a drunken bet back in 2002. Going from strength to strength, it’s now an internationally recognised multi-stage competition that’s been repeatedly earmarked as the most exciting up and coming sporting event in the last decade. The race type has gone global. Held in regions where island or lake clusters allow for numerous transitions between land and water, it brings competitors to lesser known destinations like the Isles of Scilly and the Swiss alpine valley of Engadin. SwimRun started as a simple wager between Swedish hotel owner Anders Malm and three friends, during a late night in the bar. The four men, also known as ‘The Original Four’ formed two pairs and challenged each other to a race across local islands. The challenge became an annual race, and by 2006 it had been transformed into a commercial event by Michael Lemmel and Mats Skott. ÖTILLÖ was born. Fast forward to the present day, and the race with humble beginnings has evolved from a single annual event (that saw just 11 teams enter in its first year), into a world series that attracts a diverse field of competitors. SwimRun has grown a reputation as a formidable challenge for even the most experienced endurance athletes. Combining road and trail runs, with gruelling swim legs between islands, races can last anywhere between 2 and a half hours and 10+ hours. 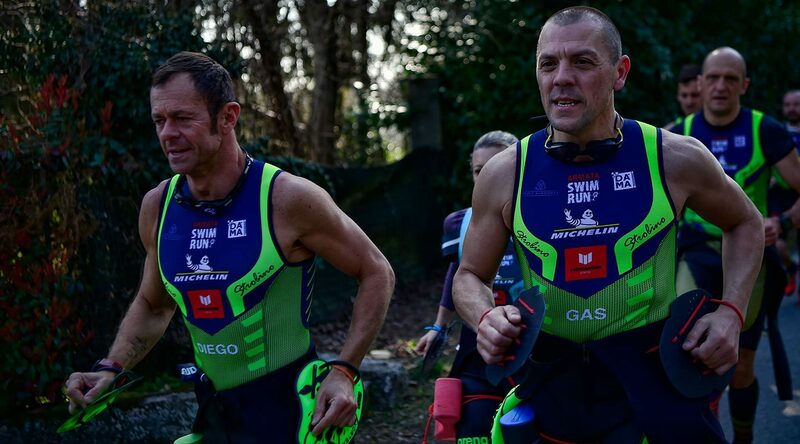 Described as “a team-sport based on two persons travelling through nature and time, completely dependent of each other,” SwimRun has an stripped back feel to it that makes it all about the experience of your surroundings and team camaraderie. “As a team you race within 10 metres of each other, you share the experience, the fun, the beauty and the suffering. SwimRun is emotion!” This is the essence of SwimRun, and the standard against which other events around the world are benchmarked. Entrants wear a wetsuit throughout, and many choose to swim in their running shoes to save on time. Each person also has the option of using purpose-made hand paddles and flippers, and can opt to use floatation aids or pull buoys during the swim legs (measuring anywhere up to 60x100cm). The rule book also allows each pair to attach themselves using a bungee cord. This is especially important when one person is a stronger swimmer than the other, as it prevents them from getting separated in unpredictable waters. 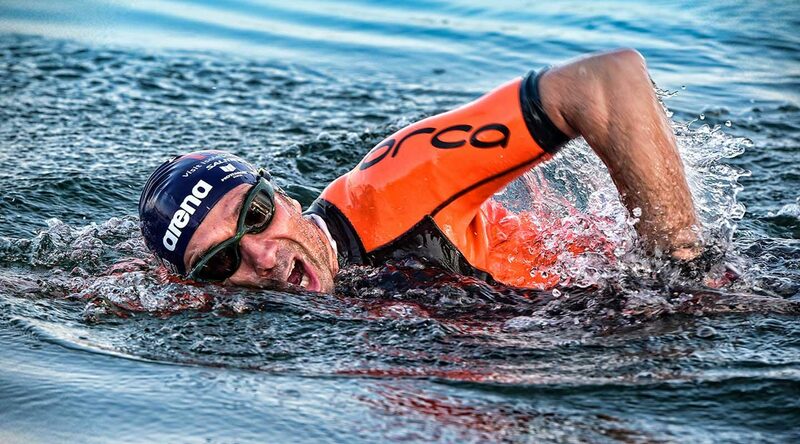 SwimRun is accessible to most people with a hunger for adventure and a competitive streak. There’s no question, it relies on plenty of training, but if you’re up for it there’s load of opportunity to get involved! Biggest of all (or The Mother of all SwimRun courses) is The SwimRun World Championship. The original ÖTILLÖ race which takes place between Sandhamm and Utö, across the Stockholm Archipelago in central-eastern Sweden is widely considered to be amongst the toughest endurance challenges in the world. The 75km course consists of 65km of trail running and 22 swim sections that sees around 300 competitors pass over the islands of Runmarö, Nämdö and Ornö. However, to get there in the first place you’ll need to “qualify in an ÖTILLÖ Swimrun World Series race, have great merits, participate in 7 races in 24 months or just be lucky”. The World Series plays out between April and September and also includes sprint events, while other Swimrun Merit races outside of the ÖTILLÖ calendar allow you collect points towards the ÖTILLÖ Swimrun ranking system. Check out the full list of Merit Races here. 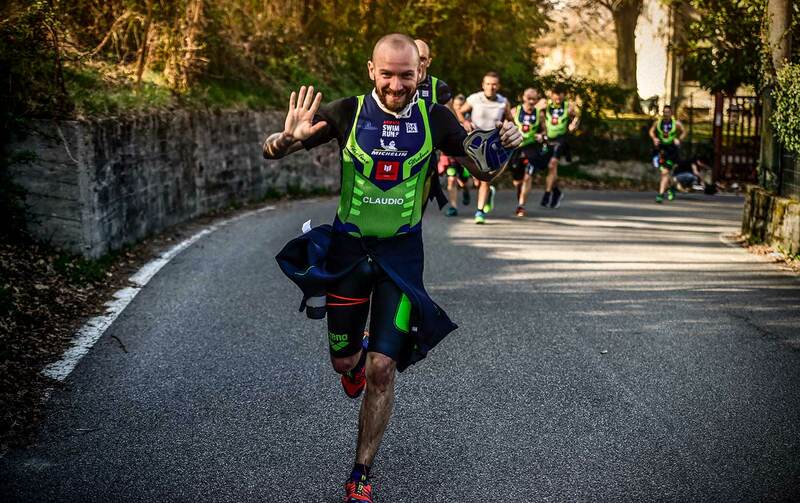 Director of Italian event SwimRun Cheers, Diego Novella describes the sport as “the greatest personal challenge, it’s the pure freedom to go beyond”. It’s this diversity that sets SwimRun apart as a passion, and as a sport in its own right. 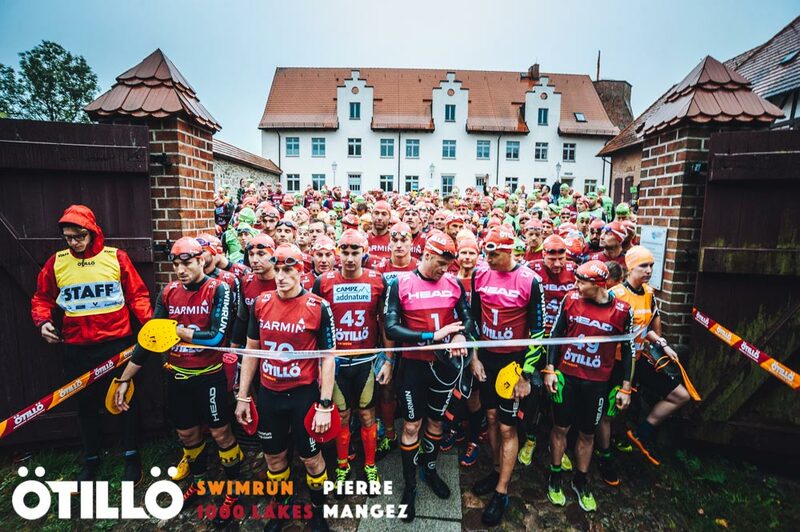 ÖTILLÖ may be the pinnacle of SwimRun, but beyond the World Series and merit races the sport has inspired an explosion of smaller events to hit the scene in recent years. Events are popping up everywhere, and with a packed calendar of independent events that stretches across six continents, the sport is booming. Most races are followed up by big celebrations and summertime parties that go on until the early hours of the morning. Because after all, what’s better than good food, great company and a few jars of beer after a long hard slog out on the course?